The weather in Mongolia can be characterized as dry, cold, and sunny. Because the country is so far removed from the regulating influence of any oceans, the continental Mongolia climate brings great extremes in weather. Even in July, you can be riding a horse up in the mountains and it can suddenly start snowing! The best times to visit are June and September: on the shoulders of summer and the tourist high season. 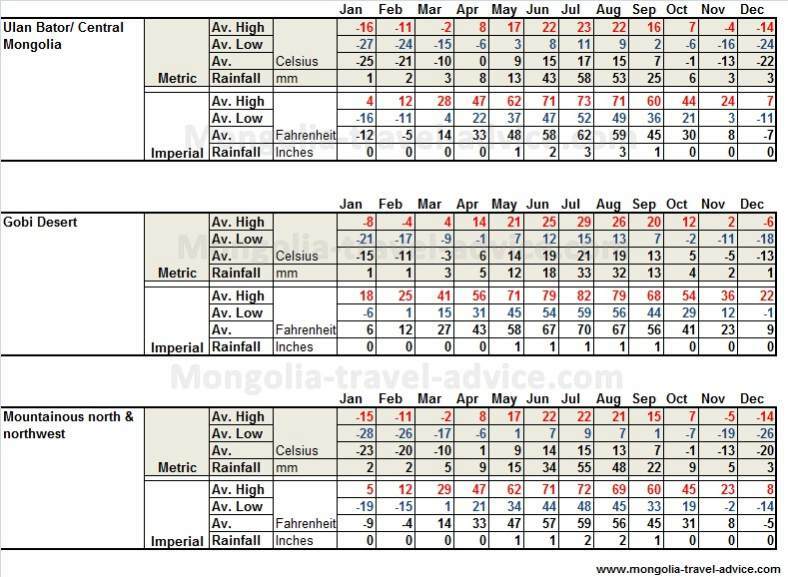 Below I'll give a brief overview of the temperature variations before describing the different seasons and what they mean to both travelers and Mongolians. Mongolia weather is at its coldest in January, when temperatures average around -20 Celsius (i.e. -4 Fahrenheit). At night, it can get down below -40C (-40F). In the colder parts in the Northern Mongolia, night time temperatures can get below -50C. Ulan Bator has an average annual temperature of -2C (30F), making it the world's coldest capital city. Click here for Mongolia climate data (opens in a new window). The average high, average low, and average temperatures are displayed in Fahrenheit and Celsius by Month. I've displayed the data by 3 separate latitudes to give you an idea of what the Mongolia weather will be like depending on where you visit. Note that these are average highs and lows only: you should be prepared for extreme weather events bringing temperature variances of +15/-20C (i.e. +60/-68F) from the average. In spring, temperatures begin to warm up and the heavy winter snows and frozen rivers begin to thaw. The ground -which freezes during winter in most of Mongolia- also begins to thaw out in the spring ('discontinuous permafrost'). This thawing of the ground renders much of the steppe in mush, and Mongolia's dirt roads become impassable. The Mongolia climate during spring is extremely unpredictable. Sunny spells, blizzards, rain showers.. during spring it can be very difficult to predict the weather in Mongolia, so visitors must come prepared. Visitors should also be aware that Mongolians hold a general dislike for spring, as its unpredictable nature can bring great death and hardship. Mongolians want a gradual spring thaw to melt the snow and reveal the dried steppe grasses, and good early rains to turn it green for their stock. The animals are weak from the long winter, and if the thaw and spring rains don't come, hundreds of thousands of animals can die. Also, an event like rain followed by a freezing blizzard can be particularly lethal: soaking both animals and herders before freezing them to death, and freezing a sheet of ice over the ground so stock cannot get to the grass to feed. In 2010, the spring weather came very late, making it a horrifically long, hard winter (referred to as Zud, in Mongolian). The ground took too long to thaw and newborn stock died of cold and exhaustion. It's difficult to know any reliable figures, but the Ministry of Agriculture estimated that over 4 million animals and over 50 people died. 2009 was also a difficult year for weather in Mongolia, with blizzards occurring right up until late May -killing people and animals. These recent zud are tragically hastening the decline of Mongolia's nomadic traditions, as many people have lost their entire herds and their way of life is no longer sustainable. Travelers should not visit Northern Mongolia before late May, as -depending on the spring weather in Mongolia- spring can be a time of misery, rotting livestock, cancelled flights, and lethal blizzards. However, May can be a okay time to visit the warmer Gobi desert, but it will get down to -10 (14F) in the evenings. In mid-summer, the average temperature of 15C (56F) is a bit misleading, as some days can get up to a sweltering 37C (100F) before really cooling off at night. The thin, dry air and limited cloud cover ensures that the moment the sun dissappears (i.e. rainstorms or night-time) temperatures will plunge dramatically. This is especially true when in the mountains. For this reason, it's best to carry multiple layers of clothing with you when traveling (see my what to pack page), as you never really know what the weather in Mongolia will do next. Summer is when Mongolia gets the majority of its rainfall. Mongolian herders eagerly await these rains for the grass they bring their livestock, and the steppe turns from a dry, dead tan to its beautiful green. Summer is when many semi-nomadic families will head out from the aimag cities to the countryside in order to tend their herds, shear their wool, and create a bewildering array of dairy products. Many of the towns become noticeably empty during this period, but out in the countryside it's a time of plenty, and you'll see the green steppe dotted with yurts. Summer is a time of constant hard work for Mongolians, but the evenings are quite social for yurt visits, and the locals will be happy to share a cup of tea at any time of the day. The rains can also bring mosquitoes and sandflies, and the roads can get a bit bogged down after long downpours, but overall summer brings decent weather in Mongolia and is a good time to visit most of the country. 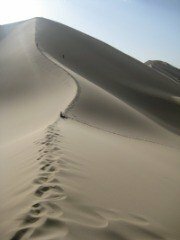 The exception is the Gobi desert, which gets up above 40C: that could spell disaster if you have a vehicle breakdown, so you should aim to visit the Gobi outside the hottest months of July and August. June is a great month to visit all around: it can be cold at night, but the weather's generally pretty pleasant and you'll miss the peak of the tourist season in July/August. In fall (i.e. Autumn), the weather in Mongolia starts to cool but is far more predictable than in Spring. It is also much less windy. Early fall is a good time to visit: most foreign tourists have left the country, and Mongolians settle down and prepare for the winter. The mountains start getting pretty cold by October, but the days are sunny and a fair few foreigners brave the cold out in the northwest to witness the Golden Eagle Festival (ethnic Kazakhs hunting with Eagles). October is still a good time to visit the Gobi. By November, the snows are setting in over most of the country and temperatures really cool off, making travel in the countryside difficult. At this time, Mongolian nomads will try to find a patch of long grass to cut for stockfeed over the winter. Once the temperatures stay below freezing, Mongolians will commence a slaughter of many of their livestock. The cold weather in Mongolia ensures that the meat will keep without spoiling all through the winter. I haven't been around Mongolia so late in the spring to witness it, but apparently the 'great slaughter' is quite public, and somewhat confronting to vegetarians! Winter is, understandably, a time for the indoors. Temperatures can get extremely low, and most foreigners without the fortitude of Missionaries and Peace Corp volunteers have all departed the country by then. Snow makes travel difficult, and blizzards can arrive at short notice, so most Mongolians avoid travel. 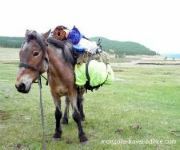 Semi-nomadic Mongolians will have headed back to the towns, leaving their family and associates to brave the winter and tend their livestock out in the countryside. A double layer of felt (wool) is wrapped around their yurts and they will venture out rarely -to use the outdoor toilet and tend the stock. The hope is that the snow does not stay so thick that the animals cannot access the grass under it, or they will emerge weak into the spring. You can still visit Ulan Bator in winter if you have a mind to, but life out in the smaller towns (without constant electricity) is difficult. Mongolians say you don't truly know their country until you spend a winter there. No doubt they're correct, but it isn't enough to get me at that time of year!